As Hurricane Irma barrels down on Florida, insurers are vulnerable to a myriad of exposures. As of this writing, all the major and minor ports serving the state have been shutdown. The Tampa, FL port is a crucial gateway for fertilizers as it handles over 20% of the US exports, with its biggest customer, The Mosaic Company, being affected in particular – not just from the port closure, but due to the closure and potential impact on its phosphate production locations in the vicinity. Mosaic serves customers in over 40 countries, and acknowledges that it conducts operations through a limited number of key production and distribution facilities. (Phosphates accounted for nearly 41% of the company’s revenues in 2016). The larger implications on agri-based businesses (including Campbell Soup, Kellogg, Tyson Foods and PepsiCo) remains to be seen. 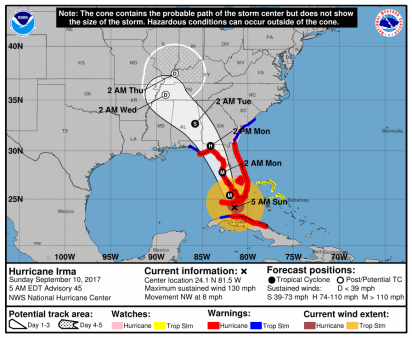 Irma is also after orange juice: Bradenton, FL based Tropicana, is the world’s largest producer of branded juice, and one of the billion-dollar-plus subsidiaries of PepsiCo. The Tropicana plant is in the path of the hurricane, and its closure could severely impact production for days to come. A more detailed connected risks report will be sent to our partners. If you wish to receive the report, please sign up with your name and contact details below. Hurricane Irma’s Forecast Cone image courtesy of the National Hurricane Center.